Anyone who has ever truly loved someone else necessarily thinks about the day that loved one will die. Once it occurs to you, it’s hard to get it out of your head. I’ve therefore long equated love with death, which doesn’t reduce love or make it depressing; on the other hand it strengthens and ennobles it. Laurie Anderson has found a way to translate this seemingly contradictory and difficult idea to the screen with her very beautiful Heart of a Dog. A collage-like personal essay film incorporating animation, painting, home movies, surveillance footage, and newly shot material, fueled by dense soundscapes and a splendid narration that can only be called musical, Heart of a Dog is, in a sense, the artist and experimental musician’s response to the 2013 death of her great love of twenty-one years, Lou Reed, yet, in a miracle of artistic displacement, Reed is never spoken of in the film. 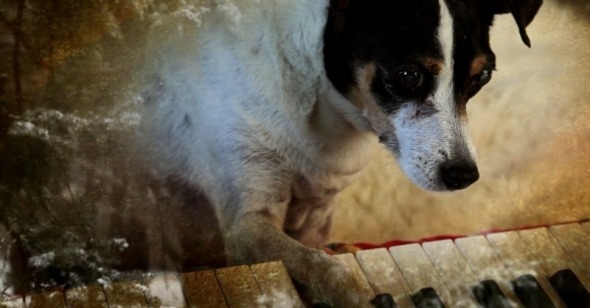 Instead, this heartbreaking and sometimes funny portrait of mourning, grief, and regeneration takes as its starting point the loss of Anderson’s beloved rat terrier, Lolabelle. That little Lolabelle was not just her dog but their dog, as can be gleaned from Anderson’s moving 2013 tribute to Reed in Rolling Stone, is another important yet unrevealed layer of the film. By not making this fact central, Anderson allows the film to keep its purity of intent and the animal to retain its selfhood—the dog is not reduced to a symbol of a great romance, but was a breathing and living being, worthy and capable of profound love. Anderson’s film moves and feels like an album, variations on a theme coursing in waves of emotion and feeling, an experience that’s both free associative and rigorously controlled. Among the many effortlessly incorporated images is an early nineteenth-century Goya painting commonly known as The Dog. It’s an enormous canvas of negative space, covered in ominous beige and charcoal-colored abstractions, as though a sky auguring a storm. At the bottom of the painting a tiny dog pokes its head up from a concrete, brown shape like an unidentifiable rock formation, craning its neck to the sky with a sense of both awe and fear. Anderson says she is fascinated by the painting for its existential heft and its use of a dog as its only point of identification. The painting also reflects the overall concept of her movie, using the unlikely starting-point perspective of a non-human to make us think about what makes us human. That the little canine is looking up connects to one of the film’s most memorable and rattling anecdotes: one day, in the early aughts, while taking a walk in the hills, Anderson realized that circling hawks were watching little Lolabelle from on high, as though the terrier was a possible catch. One swooped down, but after sizing up the dog, flew off. The point, as Anderson narrates it, is that Lolabelle herself was aware that she had been in danger, after this primal moment continually staring up at the air, and therefore realizing for the first time that threats can come from above as well as below. Considering this occurred early into the 21st century, Anderson frames it as a 9/11 allegory, reflective of our newly born, very real fear of the skies. But in the tapestry of this film, this sequence functions in a more essentially powerful way, expressing the sentience and self-aware mortality of her beloved dog, initiating a circular meditation on life and death that erases boundaries between human and animal. One of the miracles of cinema is that genuine artists can use the medium to convey otherwise inexpressible, even intangible emotions, using image and sound to create emotional landscapes that in writing might be too explicit or in music too oblique. Anderson strikes an effective balance here, allowing the honeyed tones of her glorious speaking voice to serve as the film’s soothing center. Her measured, eloquently mannered narration, which has the pleasing effect of a constant, dulcet hum, is surely as much a performance as could be found on any of her albums, and as crucially mood-setting as voice-over work by Terence Davies and Guy Maddin in their personal reverie films Of Time and the City and My Winnipeg. Anderson is occasionally given to Maddin-like digressions, whether whimsically relating a poignant dream about giving birth to Lolabelle after she had purposely sewn her into her stomach or wryly commenting on the modern condition of living under constant surveillance, at one point memorably mocking the Department of Homeland Security’s post-9/11 safety campaigns for their linguistic puzzlements (“If you see something, say something.”) At times, the film might seem to be made of disconnected strings, but the overall result is emotionally cohesive, a poetic evocation of living in a sometimes amusingly death-besotted world. It must be said that Heart of a Dog is perhaps more compelling aurally and conceptually than it is visually, as its images feel occasionally rote: high-frame-rate textures, re-enactments with a hazy blur meant to indicate the past, raindrops streaking down the frame like teardrops, Maddin-evoking faux deterioration of the screen. More exciting are the moments when Anderson indulges in pure abstraction, as when the screen becomes a mass of pulsating dark shapes meant to represent the phosphenes seen behind our closed eyelids. The greatest visual representation of the film remains Lolabelle herself, who presides over all this, mostly as an unseen spirit, though we are privy to some delightful home-movie footage of her in her later blind years, playing piano so adorablythat she could have become an easy YouTube sensation. Before finding her way to Anderson’s life, Lolabelle was the victim of a broken home, a puppy-mill dog bought from a suburban mall by a couple who soon divorced. This detail, related late into the film, stands in sharp but unspoken contrast to the loving household for which the terrier was destined, and subliminally brings the film back to Anderson and Reed’s marriage, which remained strong even as she held his hand through his final moments on Earth. In that aforementioned Rolling Stone tribute to him, Anderson, who had turned to Eastern philosophies in dealing with Reed’s death, wrote, “I believe that the purpose of death is the release of love.” This phrasing is precisely repeated in Heart of a Dog, although not about Reed’s death, but her mother’s, in an extended climactic sequence about the importance and beauty of letting go, both for the dying one and the survivor. The miracle of Anderson’s film is that it puts all of these beings—mother, husband, pet—on the same level, a line of ghosts haunting her present with equal benevolence.